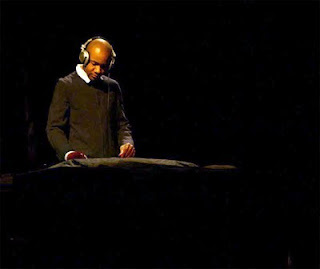 DJ Spooky is a turntablist, a producer, an author, postmodern intellectual, among other things. He has been described as the king of 'illbient' which combines the hip hop slang term 'ill' (a positive expression: bad meaning good) and 'ambient'. In 2007, Spooky made a film called "Terra Nova Sinfonia Antarctica" which really exemplifies how he uses his music to connect with nature and the world around us (in this case, specifically Antarctica). He actually ventured to Antarctica with a waterproof microphone and captured field recordings of the resonant frequencies of crystalline ice. Combining these recordings along with his trademark spinning and backed by live music creating quite an amazing live performance. Here's a clip. Below are a couple of selections from his earlier work in the mid 90's. Both are from his first album released in 1996 called "Songs of a Dead Dreamer" and are definitely 2 of my favourites of his work. It certainly doesn't stop there however, as he has released 16 albums since then varying from ambient to hip hop to dub. Great stuff mate.. love the dub!